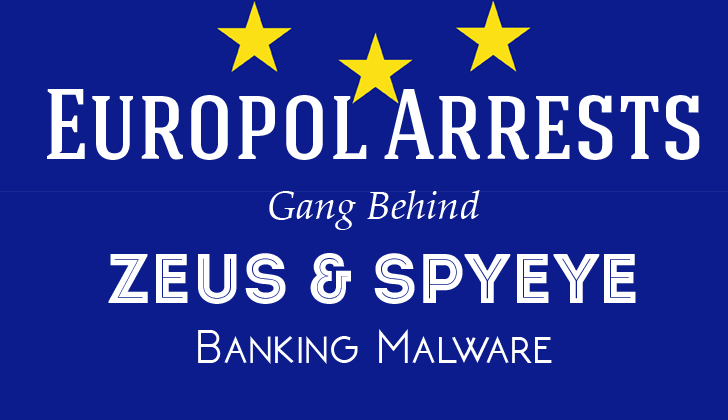 The Law enforcement agencies from six different European countries have taken down a major Ukrainian-based cyber criminals gang suspected of developing, distributing and deploying Zeus and SpyEye banking malware. According to the report on the official website of Europol, authorities have arrested five suspects between June 18 and 19. All the five suspects are the members of an alleged gang that has been accused of infecting tens of thousands of computers worldwide with malware and banking Trojans. The alleged cybercriminal group distributed and used Zeus and SpyEye malware to steal money from several major banks in Europe and outside. The gang constantly modified its malware Trojans to defeat the security protocols of banks and used "mule networks" to launder money. "On the underground digital forums, they actively traded stolen credentials, compromised bank account information and malware," Europol said in a statement on Thursday, "while selling their hacking ‘services’ and looking for new cooperation partners in other cybercriminal activities." Each cyber criminal of the alleged group had their own speciality. Also, the cyber gang was involved in developing malware, infecting machines and trading stolen bank credentials, malware, and hacking for hire services in underground fraudster forums. According to officials, the gang has caused financial damages estimated at more than 2 Million Euro. The operation was conducted by the Joint Investigation Team (JIT), and the take-down was part of an ongoing initiative launched by Europol in the year 2013 that has resulted in 60 arrests to date. Just two months ago, the law enforcement took down highly sophisticated BeeBone botnet that had infected more than 12,000 computers worldwide. Also, the ongoing initiative resulted in took down of Ramnit botnet, which infected over 3.2 Million computers worldwide. Last year the FBI and Europol tore down the GameOver Zeus botnet, although it came back a month after its took down.